It's 8:30 am on a work day and my feet have the feral Sasquatch look usually reserved for music festivals and camping trips. Indeed, I have been camping—but I also have a work meeting in about 15 minutes. Behold, the woes of a briefcase vagabond—one with a bucket list of outdoor spots to explore, but a real-life J-O-B that keeps the realistic list short. Living as a card-carrying member of the weekend warrior class, I thought, how was I ever to get to the most basic of paddle spots I'd been wanting to experience—let alone to the more remote, more peaceful and serene ones? Summer is only so long. 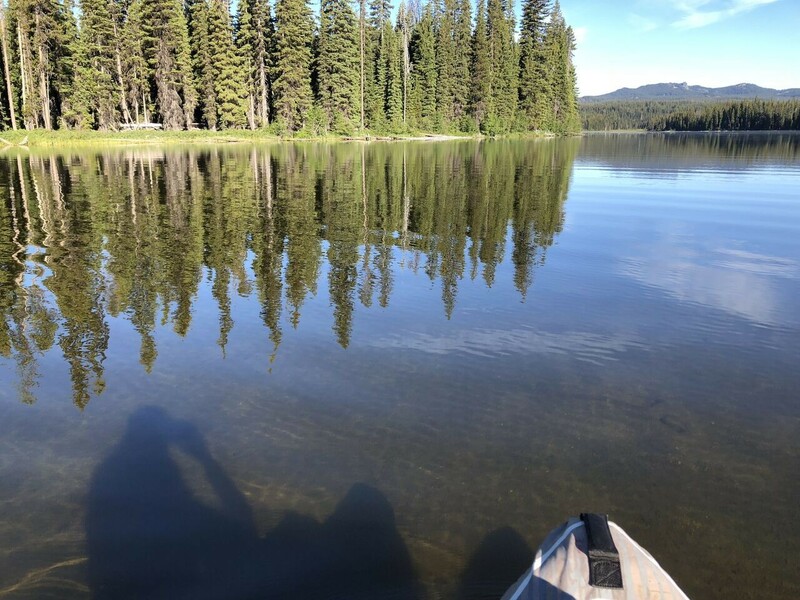 I decided to get strategic, carving out a 10-day period, not taking any days off work and assigning myself the mission to paddle on 10 lakes I'd never been to before. To those who greeted me at the office, it appeared I was experiencing another ho-hum stretch of 10 days. To this briefcase vagabond, I was having the outdoor staycation my FOMO soul desired. Criteria: I own an inflatable sit-on-top kayak with a decidedly small fin, which packs into a convenient backpack. She's flatwater-only—so paddling where motor boats are allowed and have the potential to create major wake-waves is not exactly relaxing. Thus, criterion one: Attempting to find lakes with no motor boats allowed, or at least ones not known for heavy motor traffic. Criterion two: Accessible public lands where primitive camping is allowed. Tam MacArthur Rim looms over Three Creek Lake south of Sisters. Saturday dawns and it takes a while to assemble cooking and camping gear, prep food, procure ice and check my gear. I make it to Three Creek Lake as the heat begins to wane, donning a hoodie as my dog and I float in the cool glacial cirque under Tam MacArthur Rim. A few fishing boats dot the shoreline, but traffic fortunately remains light. 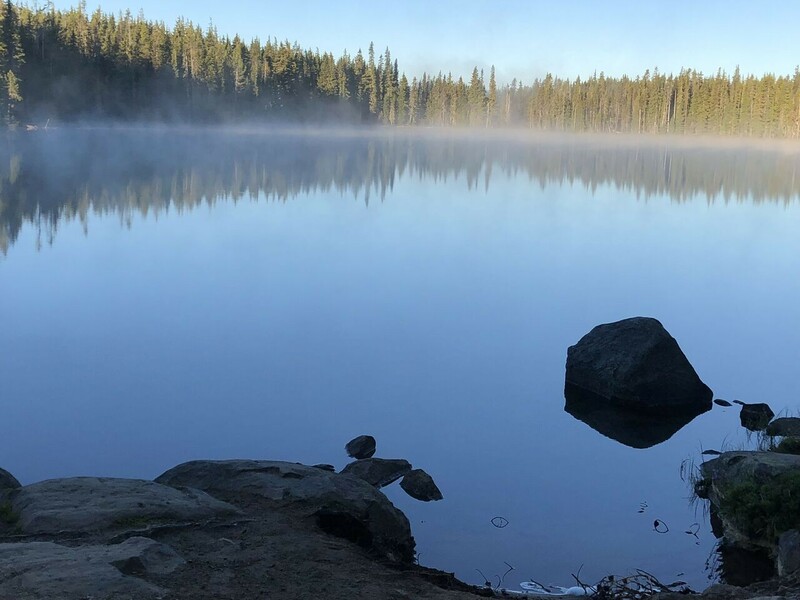 The Tam MacArthur Trail is one of the area's busiest—so much so that officials from the Deschutes National Forest are currently considering adding a quota system to it and other busy trails in the Forest system. I duck onto a forest road to spend the night, treated to a poetically gorgeous sunset over the Three Sisters. Day one: win. In conceiving this adventure, I had one additional criterion I wanted to include: boondocks. With my arrival at Clear Lake, however, I had to throw out notions of blissful solitude. Clear Lake, constituting the headwaters of the gorgeous McKenzie River, is an excellent place to witness osprey doing their thing—but you'll share that privilege with the throngs exploring the lake and the nearby waterfalls and trails. Since the water is icy cool, I hit the McKenzie River Trail on my bike to warm up for a swim and paddle, starting out at the trailhead. Noob tip: take the River Trail by crossing the bridge at the trailhead, instead of heading straight, up the steep Santiam Wagon Road, like I did. And if you're not into popping tires on lava, skip the trail on the east side of Clear Lake. The trail that skirts the west side can be busy, but it's a headache spared. After riding the lava side myself, I'm ready to dive into Clear Lake—and maybe not come up again. 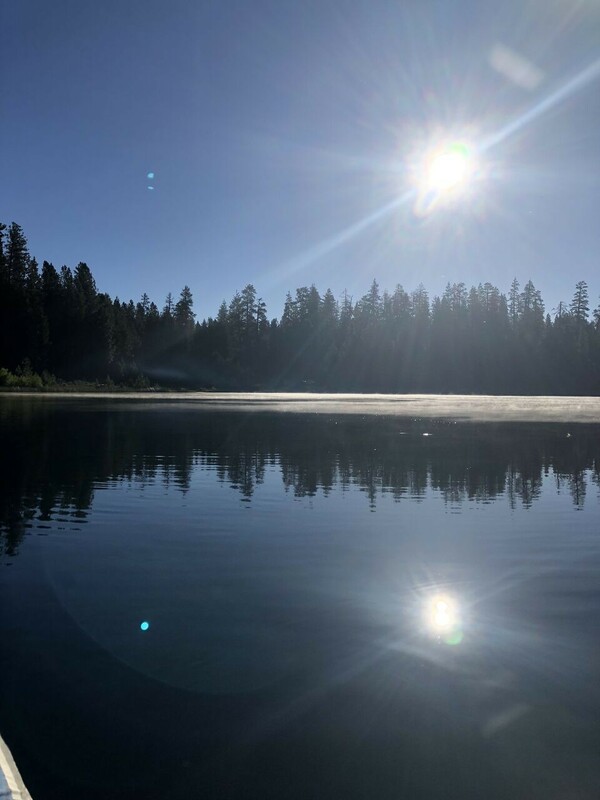 I sleep in a National Forest pull-off near the McKenzie River Trail, deciding to hit another lake before heading back to the Monday morning workday. Not having much time, I head to Carmen Reservoir. Not much to see here besides the babbling waters of the McKenzie flowing into the reservoir and the movements of countless insects flying above the water, dipping in periodically and creating tiny waves. As compared to the rush of the workaday world and its demand to be detail-oriented, I prefer this version of "leaning in"—noticing the tiny creatures that otherwise go unnoticed. I barely make it to work by 9 am. Shower? I do that at noon, when I head home for an hour. Maybe my co-workers notice the messy hair and bedraggled look; maybe they think it's just another Monday. Monday goes smoothly, so I take an ambitious approach to the next adventure. 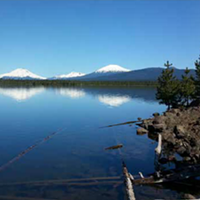 Irish and Taylor Lakes are two of the lesser-known lakes accessed via the Cascade Lakes Highway, and require a high-clearance vehicle. No, seriously—don't try this with your Subaru. Getting there involves driving past Little Cultus Lake and continuing on a bumpy Forest Road for a mere 4 miles—which might not seem like much, but 45 minutes of deep ruts and potholes later and you'll see why this is one of the most remote lakes on this tour. One SUV passes me, so I slow down and ask how it is up there. "Mosquitoes!" the couple cries as they wave their hands, roll up their windows and promptly move along. I shoo away a few intrepid skeeters that enter through my window, not ready to give up. When I make it to Taylor Lake, it's nearing dusk. I open the door only to have the truck's cab swarmed by a few dozen giant mosquitoes. I quickly hop back into the truck and set to mass mosquito murder. 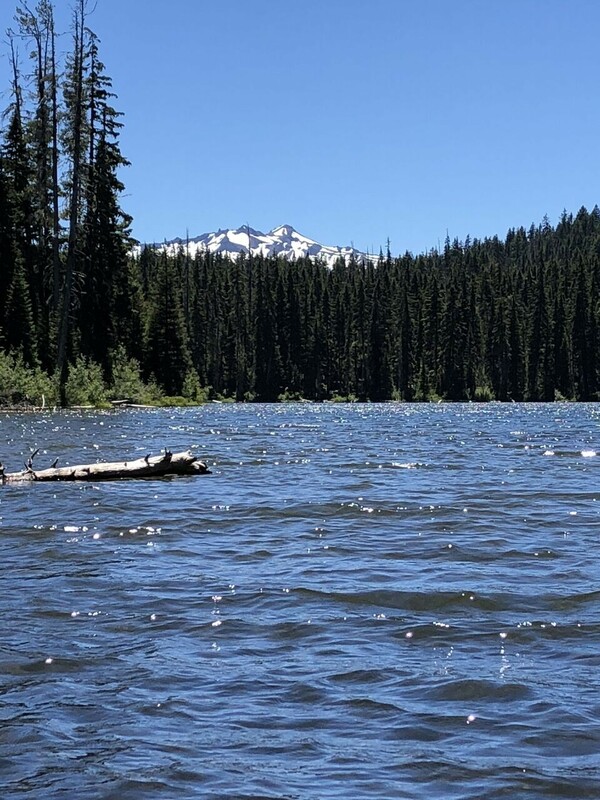 Mostly, my visit to Taylor Lake consists of eating salami and cheese and reading in the back seat of my truck, which I outfitted with a futon as a makeshift camper bed. At pitch dark my dog and I venture out, the mosquitoes now gone. I'd planned to paddle Taylor, the first of the pair, in the evening, and then to venture to the adjacent Irish Lake in the morning. Due to the swarm, my paddling consists of a quick early-morning buzz around Taylor in near-freezing temperatures, the beach sand so cold that the water is actually warmer on my bare feet. Leaving Taylor Lake in the wee hours, I'm disappointed I haven't been able to knock a second lake off my list. Since Tuesdays can be hectic days at work, I don't know if I'll be able to get to a lake later on. After braving the rough road back to Little Cultus, I decide my dog and I have earned a paddle there. Little Cultus is far less busy than big Cultus—and while they're allowed here, this morning involves no loud motorboats knocking wakes around. While the lake doesn't boast sweeping views, it does have a lovely, deep-woods bike trail that skirts the east side of the lake before wending its way around Cultus Lake. Hitting two lakes in one morning, I call it a win that I arrive only 15 minutes late to work. Tuesday's work day ends early, so there's time to make it to another lake after all. 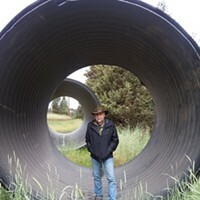 I head toward the Twin Lakes just southeast of Bend, known as ideal rainbow trout fishing spots and not overly crowded. It's later than I'd like when I arrive, so I head for one of the spiderweb of fire roads around North Twin to sleep. In the morning, mine is the first craft on the water. I guess being a briefcase vagabond who must make it back to work means I even beat the fisherfolk. 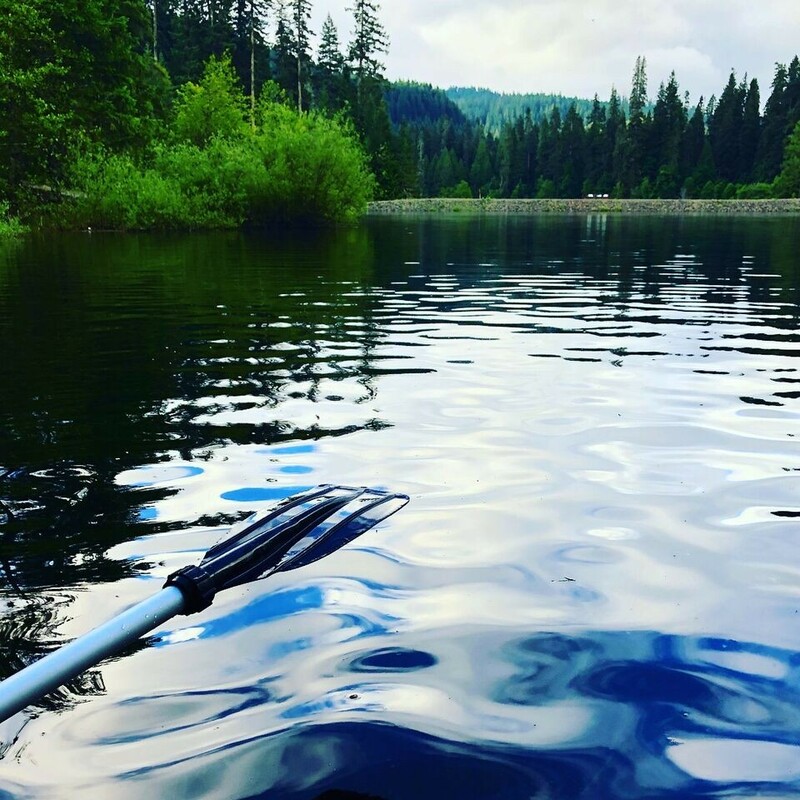 North Twin is a bit non-descript, save for the birds soaring overhead, but a serene paddle alone on the water is always worth the trip. I make it back to Bend with just enough time to skate into 92.9 for my weekly radio spot, dirty feet hidden under those closed-toe shoes. Some less-than-ideal algae at Blue Lagoon didn't stop this paddler from experiencing the spot's aquamarine delights. It's Wednesday and something of a take-a-breath day around the newsroom, so I have a little time to contemplate my next move. It's gotta be somewhat more remote, I resolve, and perhaps requiring a short hike. I settle on Blue Lagoon, an off-the-beaten-path spot near the headwaters of the Deschutes River. Getting there requires finding a trailhead on the left side of the road, about ½ mile past the turnoff for Little Lava Campground, marked by the typical bulletin board-style board, but lacking a sign saying anything about Blue Lagoon. Look for a small sign to the right of the bulletin board, pointing to a singletrack trail; don't make the mistake I did and take the wider doubletrack trail to the left of the board. After hiking for about ½ mile, Blue Lagoon comes into view. Algae and grasses make entry into the water a little daunting—but the serene, and often-deserted, green-blue waters and the view of Mt. Bachelor make wading through the green growth well worth it. I find a place to sleep on a dirt road pull-off, with another mystical view of Mt. Bachelor looming. I start Thursday by paddling around Little Lava Lake (the actual source of the Deschutes) and soaking in the eye-candy views of the Three Sisters and Bachelor. This lake does allow motorized boats—though I don't see any. With a stop at the Wanoga pump track on the way back into Bend, the past 24 hours have been nothing short of magic—and it's still squarely the work week. Do my co-workers care that my hair is more mussed than usual, that my truck is a holy terror of granola bar wrappers, dog hair and spilled whiskey? Nope; and neither do I. I'm tired and this project is stretching me, but it reminds me I can be stretched, and that adventure doesn't have to wait for the weekend. It's the weekend and I'm making no time to clean the car, the cooler or the futon bed still taking up the back seat. I take a day or so off to go to a concert, and then I aim for a two-for-one by checking out the little-known pair of Marilyn lakes, roughly 30 miles east of the mountain biking mecca of Oakridge. The closer of the two, Lower Marilyn, is a mere ¼ mile from the parking area. Some folks blasting new country from a battered speaker are posted up at the junction with the lake, so I make my way to Upper Marilyn, less than a mile hike, which I have to myself. The north end, where I put in, has a few poky trees in the water, so I'm extra careful not to get a hole in my boat. This side also has a view of Diamond Peak nosing its way above the trees; by the time I paddle to the other side, it's hidden below the conifers. Diamond Peak over Lower Marilyn Lake. 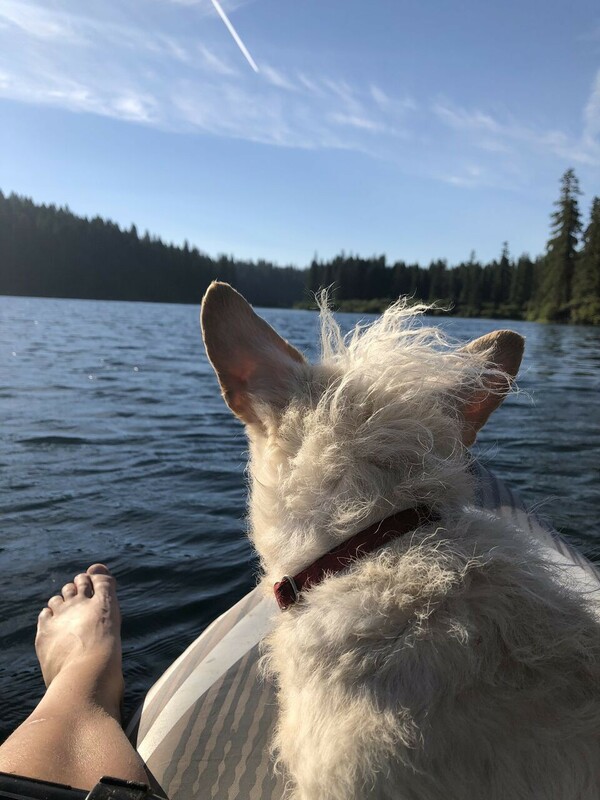 As I paddle on Lower Marilyn, hawks and osprey circle above me, maybe setting their sights on my small dog, who by this time is so at home on the sit-on-top that he tries to get on before I even have the thing blown up. Unlike me, he never cares what his hair looks like when 9 am rolls around. Maybe I'm slowly learning to be like him. It's nearing the end of this adventure, and while it's something of a relief, I know I've knocked a lot off my list of adventure spots during these 10 days—10 days which I could have easily frittered away at bars or the movies or in some other, less ambitious pursuit. Like staying late at work.